Site: Light and well drained soil. Chervil goes to seed quickly in the heat, and unlike other culinary herbs, prefers a cool, moist and shaded location. Growing: Thin so that plants are 6 inches apart and water regularly in dry weather. Chervil is one of those herbs grows well in containers. Harvesting: Remove leaves from the outside of the plant when gathering for the kitchen. At the same time remove most (but not all) flower-heads - leave a few to produce seeds for a self-sown crop next year. Like with most herbs harvesting promotes new growth. Use only the young green leaves. When the plant matures and the leaves turn a purple, bronze color, the leaves lose their pungency. Culinary Uses: Add finely chopped leaves to soups, fish and egg dishes, just before serving. Garnish salads with it. Add to dishes at the last moment before serving. 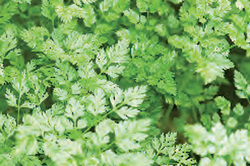 Chervil is what gives Béarnaise its distinctive taste. Chervil tastes great with salmon, trout, young asparagus, new potatoes, baby green beans and carrots, salads of spring greens. Chervil's flavor is lost very easily, either by drying or by heat.